The "Realm of Neptune Installation", a stage set designed and constructed for a dance performance at "Level" in Miami Beach, incorporates a number of sculptures. 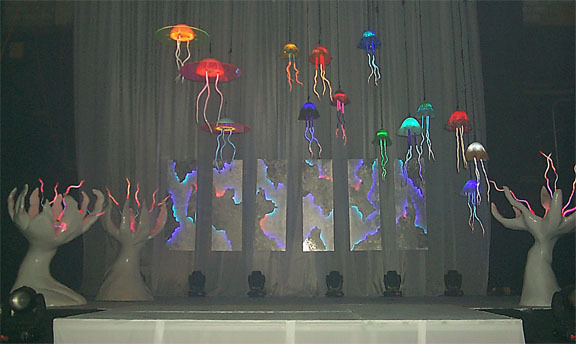 Most obvious are the Jellyfish: eleven of them were suspended above the stage as well as three Space Jellies. In the background of the installation is the Realm of Neptune Series suspended in front of the rear stage curtain. Finally, there are three Neptune's Flora, large sculptures flanking the left and right stage. For views of the complete set as a QuickTime movie, click here.